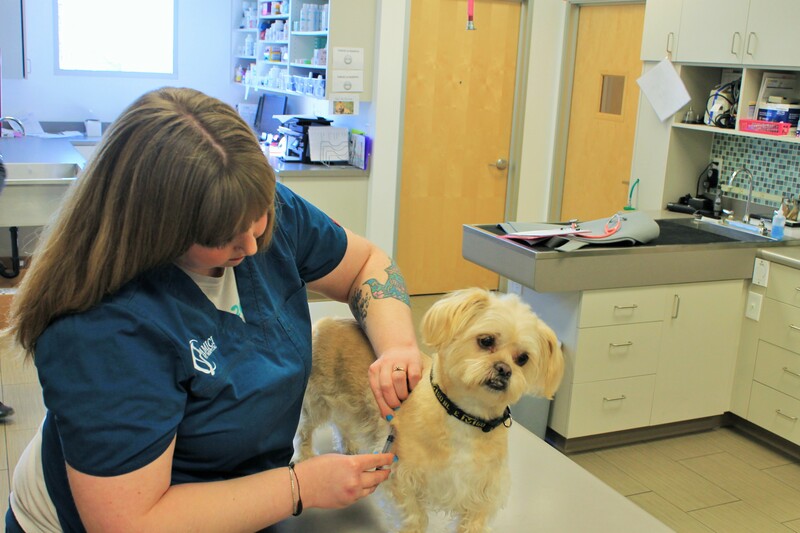 As with humans, vaccines are available for dogs and cats to help keep them from contracting specific diseases. The vaccinations are a weaker, less harmful version of the diseases that will help to build your pet’s immune system to protect them from illness. Rabies Vaccine – Protects against rabies, a fatal virus that causes neurologic disease and is spread by a bite or scratch. DA2PP Vaccine (4-in-1 combination) – Distemper is potentially a fatal virus that is spread by respiratory secretions and can cause neurologic, respiratory, and gastrointestinal disease. Adenovirus Type 2 is spread by feces, urine, and saliva of dogs and wildlife, and can cause infectious hepatitis (liver disease). Parvovirus is potentially a fatal virus that can cause vomiting, diarrhea, lethargy, and decreased appetite. Parainfluenza is a respiratory virus that is spread by respiratory secretions. Bordetella Vaccine – Protects animals from developing a highly contagious upper respiratory disease, commonly known as Kennel Cough. Rabies Vaccine– Protects against rabies, a fatal virus that causes neurologic disease and is spread by a bite or scratch. FVRCP Vaccine (3-in-1 combination) – Protects against Feline Viral Rhinotracheitis, a herpes viruses found in wild and domestic cats, and cause severe upper respiratory infections. If carried long-term, they can cause continued intermittent infections throughout their life.This vaccine also protects against Calicivirus, a respiratory virus that can attack the lungs, the oral cavity, the intestines, and the joints.It also protects against Panleukopenia (feline Distemper), which is a highly contagious and potentially fatal systemic disease of cats. The virus is shed in urine and feces of cats and raccoons and may survive for years in a contaminated environment. Leukemia Vaccine – Protects against Feline Leukemia Virus, which is potentially a fatal viral disease spread through respiratory secretions between cats. All at-risk cats should be vaccinated. Cats should be tested for FeLV and FIV (feline HIV) if they are new to the owner or a new kitten, spend any time outdoors, have been in a fight with another cat, or if they are ill. We do not vaccinate against FIV.